The MQ-4C Triton broad area maritime surveillance (BAMS) unmanned aircraft system (UAS) is developed by Northrop Grumman, for the US Navy. Image courtesy of Alan Radecki. The first MQ-4C Triton BAMS UAS unveiled during a ceremony at Northrop Grumman's Palmdale manufacturing facility. Image courtesy of Alan Radecki. The first MQ-4C Triton BAMS UAS undergoing final assembly at Northrop Grumman's factory. The MQ-4C Triton BAMS UAS is expected to enter service in 2015. 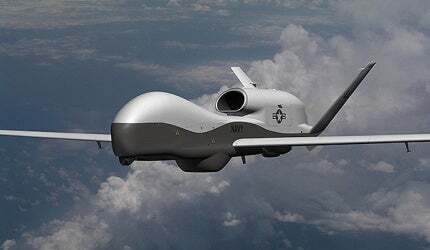 The MQ-4C Triton BAMS UAS is powered by Rolls-Royce AE3007H turbofan engine. MQ-4C Triton is a new broad area maritime surveillance (BAMS) unmanned aircraft system (UAS) unveiled by Northrop Grumman for the US Navy. The UAS will complement the navy’s Maritime Patrol and Reconnaissance Force family of systems, delivering SIGNET (signals intelligence), C4ISR and maritime strike capabilities. The MQ-4C Triton programme is managed by the Persistent Maritime Unmanned Aircraft Systems Programme Office (PMA-262). "The MQ-4C Triton is a new broad area maritime surveillance (BAMS) unmanned aircraft system (UAS) unveiled by Northrop Grumman." The BAMS UAS was acquired under a US Department of Defence (DoD) Acquisition Category (ACAT) 1D programme and Northrop Grumman was awarded a $1.16bn contract for the MQ-4C BAMS programme in April 2008. The programme saw the completion of preliminary design review in February 2010 and critical design review in February 2011. The first of the three fuselages of MQ-4C was completed in March 2011 and the ground station testing of multifunction active sensor (MFAS) radar was completed in November 2011. The flight testing of MFAS on the Gulfstream II testbed aircraft began in February 2012. The first MQ-4C Triton was unveiled in June 2012, while the maiden flight for the UAS was conducted in May 2013. The MQ-4C completed its ninth trial flight in January 2014 and operational assessment (OA) in February 2016. The US Navy intends to procure 68 MQ-4C Triton UAS to carry out surveillance missions, along with the manned P-8 Poseidon maritime patrol aircraft. The MQ-4C Triton is based on the RQ-4N, a maritime variant of the RQ-4B Global Hawk. The main aluminium fuselage is of semi-monocoque construction, while the V-tail, engine nacelle and aft fuselage are made of composite materials. The forward fuselage is strengthened for housing sensors and the radomes are provided with lightning protection, and hail and bird-strike resistance. The UAS has a length of 14.5m, height of 4.7m and a wingspan of 39.9m. It can hold a maximum internal payload of 1,452kg and external payload of 1,089kg. The MQ-4C is a high-altitude, long-endurance UAS, suitable for conducting continuous sustained operations over an area of interest at long ranges. It relays maritime intelligence, surveillance and reconnaissance (ISR) information directly to the maritime commander. The UAS can be deployed in a range of missions such as maritime surveillance, battle damage assessment, port surveillance and communication relay. It will also support other units of naval aviation to conduct maritime interdiction, anti-surface warfare (ASuW), battle-space management and targeting missions. The MQ-4C is capable of providing persistent maritime surveillance and reconnaissance coverage of wide oceanographic and littoral zones at a mission radius of 2,000 nautical miles. The UAS can fly 24 hours a day, seven days a week with 80% effective time on station (ETOS). The payload is composed 360° field of regard (FOR) sensors including multifunction active sensor (MFAS) electronically steered array radar, electro-optical / infrared (EO/IR) sensor, automatic identification system (AIS) receiver and electronic support measures (ESM). The payload also includes communications relay equipment and Link-16. The MTS-B multispectral targeting system performs auto-target tracking and produces high-resolution imagery at multiple field-of-views and full motion video. The AN/ZLQ-1 ESM uses specific emitter identification (SEI) to track and detect emitters of interest. MQ-4C Triton is powered by a Rolls-Royce AE3007H turbofan engine. It is an advance variant of the AE3007 engine in service with the Citation X and the Embraer Regional Jet. The engine generates a thrust of 8,500lb. The UAS can fly at a maximum altitude of 60,000ft. It has a gross take-off weight of 14,628kg. Its maximum unrefuelled range is 9,950 nautical miles and endurance is 30 hours. The maximum speed is 357mph. The UAS is operated from ground stations manned by a four-man crew, including an air vehicle operator, a mission commander and two sensor operators. "The UAS can fly 24 hours a day, seven days a week with 80% effective time on station (ETOS)." The ground station includes launch and recovery element (LRE) and a mission control element (MCE). The MCE performs mission planning, launch and recovery, image processing and communications monitoring. The LRE controls related ground support equipment as well as landing and take-off operations.